Not so fast, Atburn University—that’s a Montgomery Advertiser typo. 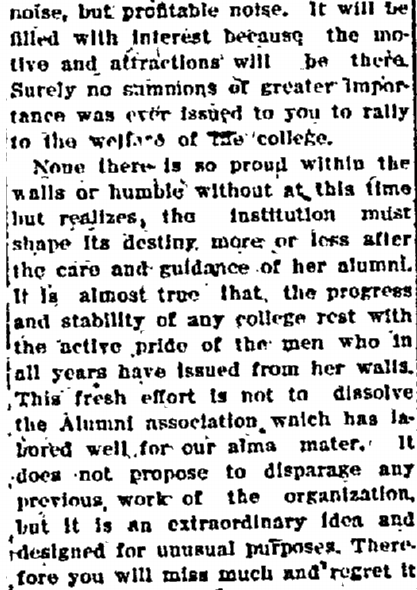 It’s actually good ol’ Auburn celebrating its first homecoming in 1909, and not in 1913, like we all for some reason thought and celebrated Saturday. It’s come to our attention that our quick story on how this past Saturday was more than likely the 104th anniversary of homecoming at Auburn, rather than the 100th, ruffled some official feathers. That’s understandable, I suppose. It costs money to reprint programs, and deleting tweets is a pain—I get that. But it wasn’t run as some sort of last minute “gotcha!” I was as “uh-oh” as anyone, having, you know, just done this big thing on Auburn’s “first” homecoming, how awesome and 1913 it was, and had it all front and center on the site to make it extra definitive. 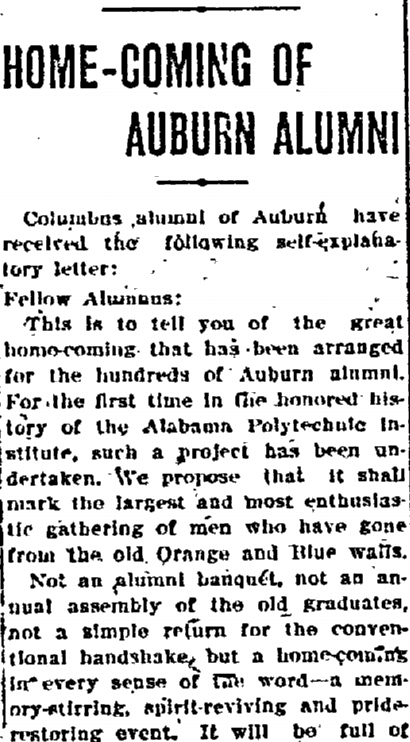 And then I’m researching some other stuff and, dang, stumble across an Auburn’s 1913 homecoming story I had missed. Probably because it was from 1909! What was I supposed to do—not report that we’ve been awesome even longer than we’ve all thought? Become an accessory to the greatest cover up in homecoming history?! My thinking was that whatever embarrassment stemmed from getting the numbers wrong would be offset by the resulting pride of what those numbers might mean: That Auburn maybe had the first homecoming in America. Remember how I thought that the Smithsonian would maybe back fellow 1909’ers Baylor, even after they rushed to read the latest TWER post about Auburn’s six-month’s-older claim to the throne, because Baylor had traditional homecoming stuff like parades and photographers to document parades and a bunch of other pretentious stuff? Auburn’s lower-case “home coming” could easily be viewed as somewhat prosaic in comparison (at least in comparison to what I had at the time for comparison), too weak to father so grand an American institution… if it, you know, even happened. But turns out, this wasn’t just some casual I Think We Have Some Pizza Left get together of whatever old bros happened to be in town and go the text. It was a full-fledged shindig. It’s like selling ourselves short historically has itself become an Auburn tradition. 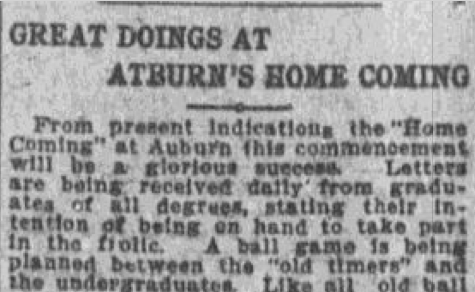 “Great Doings at Auburn’s Home Coming”—that was the headline of one of the no fewer than four homecoming stories the Montgomery Advertiser ran leading up the event (the Columbus Daily Enquirer had at least one, too), including one the day of, i.e. the first day of: It lasted from Sunday to Wednesday. I’ve yet to track down a story from after the thing, but unless they decided to cancel it and turn the sons of Auburn and the VIPs from other colleges and “some of the foremost speakers in the United States” and his excellency Governor B.B. Comer (coming to review the junior class cadets) around on their trains, it did happen. Heck, we even had a Festival of Lights! Just like in ’13! Ditto the old timers vs. whippersnappers baseball game. And actually, the 1909 edition seems like it was even more sports-centric. 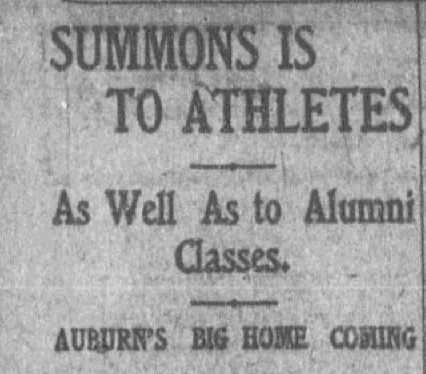 The headline of the Advertiser’s second story: “Summons Is To Athletes As Well As Alumni Classes (for) Auburn’s Big Home Coming.” Members of Auburn’s first football team, including father of Clemson football Walter Riggs, who would in a year be Clemson’s president, were expected to attend “to get another touch of the old college spirit.” Petrie was going to tell stories. 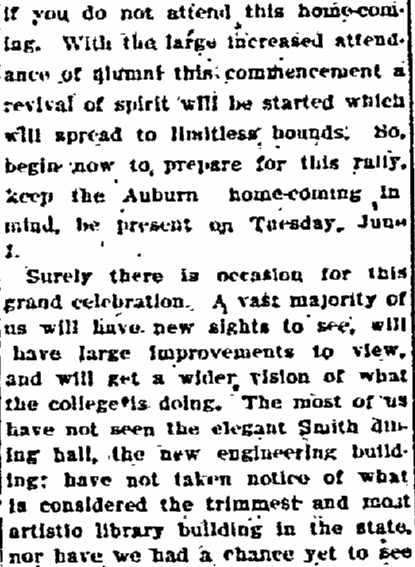 The obvious question remains: Why did the organizers of Auburn’s 1913 homecoming speak as if it were the school’s first when a celebration similar not only in purpose, but as we see now, even in scope and promotion, should have been so fresh in the memory? Heck, the word “grand” was even tossed around in the 1909 descriptions, so there goes my stupid semantics theory. For a second, I thought the answer may actually have been something as trivial as, don’t laugh, the invitations. 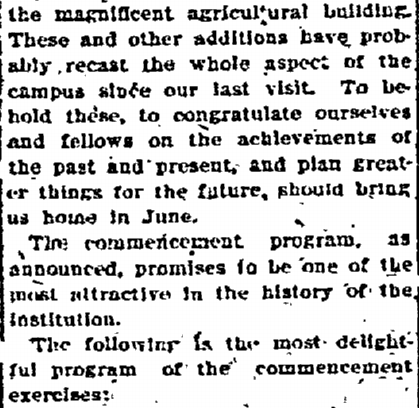 Because ol’ Tom Bragg, the driving force behind the 1913 blowout, seemed especially proud that invitations to the homecoming were personally sent by the Auburn Alumni Association to every graduate, as if that itself was maybe what had never been done, not just at Auburn but in the country. Maybe 1909 was more of a word of mouth, read it in the paper type thing? 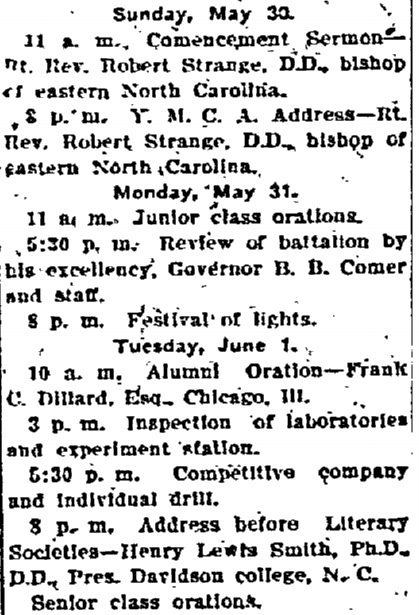 This was printed in the Columbus Daily Enquirer on May 28, 1909, just two days before the event. National championships in football, national championships in homecoming… oh, and local Auburn historian Ralph Draughon Jr. (junior to that Ralph Draughon, for crying out loud), recently wrote TWER to remind us that this season’s celebration of a century’s worth of theater at Auburn is actually 17 years late. Sorry, Coach Heisman. It’s like selling ourselves short historically has itself become an Auburn tradition. War Eagle? Like us on Facebook. Follow us on Twitter. Want to advertise? Support original Auburn research. 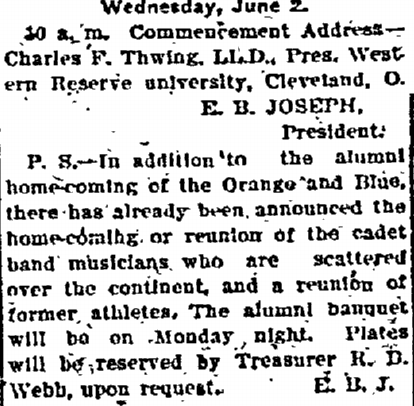 I like how the 1913 home coming was essentially a repeat of 1909. Kind like how this season feels a lot like 2009. Man, doesn’t it though? And you know what that means. Outstanding research. My grandfather earned his BS degree from API that very June so this article has a special meaning to me. Note also the Band might need to reconsider when its first reunion was held. Apparently it was NOT 1988 or so.